Jeff Allen is the best at what he does–making people laugh as hard as humanly possible with clean funny jokes. His trademarked Happy Wife, Happy Life message of a marriage gone wrong and redeemed has given laughter and encouragement to millions of people. Jeff’s comedy drives home the humor in everyday family life and the joy derived from a healthy marriage. He Combines Clean, Hilarious Comedy with Inspiration. Just who is Jeff Allen... and how on earth did a former atheist from Chicago’s South Side, who’s crawled across the grittiest comedy club floors in America become the world’s funniest, most inspiring comedian? 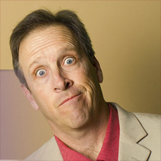 Jeff Allen has been doing comedy for four decades and his work has been seen on every cable comedy show in the U.S. including Comedy Central’s Premium Blend and VH1’s Standup Spotlight. His one-hour special, ‘Happy Wife, Happy Life’, aired on the Odyssey Channel, and Family Net. He was a featured comedian at the U.S. Comedy Arts Festival in Aspen and the Montreal Just for Laughs International Comedy Festival, the most prestigious comedy Festivals in the world. He also headlined his own national comedy tour, Jeff Allen & Friends: Funny People of Faith. Jeff Allen is one of the few comedians who can kill ‘em at a casino in Vegas and then bring down the house at the Baptist Youth Missionary Board... doing the exact same act. As Jerry Seinfeld said, Funny is funny. Clean humor, if it’s good, works anywhere. Jeff says he doesn’t need to change a thing from one venue to the other – although frequently his church appearances include inspiring testimony about his battle with the bottle and finding himself. The words may not change, but what has changed radically is the man who delivers them. It’s hard to believe that the Jeff Allen, who works at Church and faith venues around the country, is the same Jeff Allen who used to get mail addressed to Mr. Psycho. Jeff wasn’t always a happy, well-adjusted comedian. At one point, he was a victim of alcohol and drug abuse, living a depressing life and struggling to get by from day to day. Finally, the threat of losing the one person who had been his touchstone through those struggles made him turn to a new source of strength. Today, Jeff Allen is on top of the world. At the peak of his comedic powers, he co-starred in and produced his own sitcom pilot with some of the most talented people in Los Angeles. "Hilarious! From the moment Jeff started until the end of his performance, our group was laughing until our sides ached. He has a keen ability to describe real life situations in such a way that you can visualize exactly what he is talking about. Our group is multi-generational and Jeff was a huge hit with everyone! Clean comedy at it's best!"